Product News – Listen, Inc. Listen is excited to announce the release of SoundCheck 16.1. This minor release, which contains some exciting new features, is available free of charge to all registered users of SoundCheck 16.0. 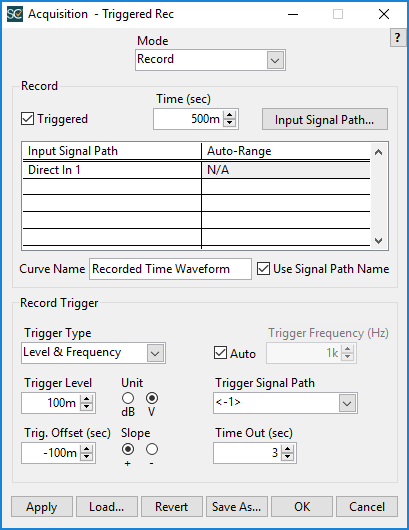 We also have a free measurement sequence using the frequency trigger that can be downloaded from our website so that you can test it out right away! View Sequence. SoundCheck now also fully integrates with the Mentor A2B interface for testing automotive audio connected via the Analog Devices A2B digital bus. 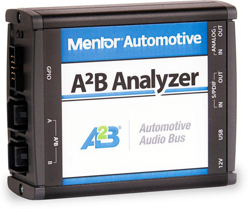 The Mentor Analyzer, which handles the transmission of signal in to and out of the bus, is viewed as an ASIO interface by SoundCheck, enabling SoundCheck to read/write to the device and therefore analyze any transducer connected to the A2B bus. A custom VI permits control of the Mentor A2B interface configuration via SoundCheck. This means that it can be controlled from within a SoundCheck sequence, for example loading configurations and starting/stopping ASIO streams. 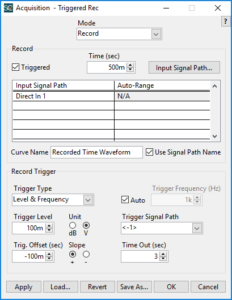 This makes it an ideal R&D or production line test solution for automotive audio, or for anyone testing transducers connected via A2B bus. More. 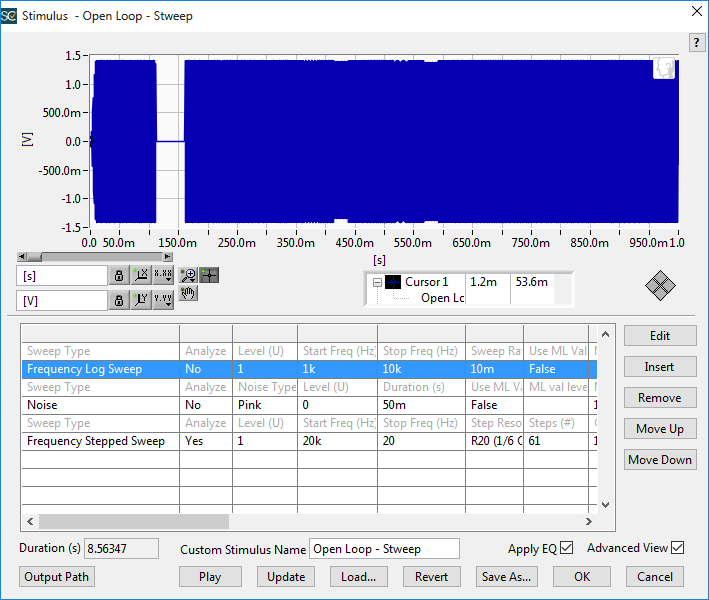 Also available (additional cost) with this new release are two optional sequences – background noise simulation to the ETSI ES 202 396-1 standard, and the TIA-920B dual-bandwidth telephone test standard. The background noise simulation sequence (part number 3121) is a cost-effective alternative to dedicated background noise generation systems. It calibrates a 4.1 speaker array to conform with the ETSI ES 202 396-1 Standard, providing an equalized, calibrated playback solution to stress devices in a standardized and repeatable way. 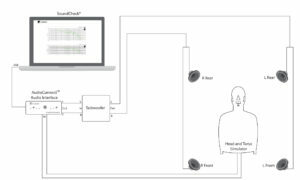 The sequence includes a library of real world binaural recordings from the standard, and custom or user-defined binaural recordings may also be used. 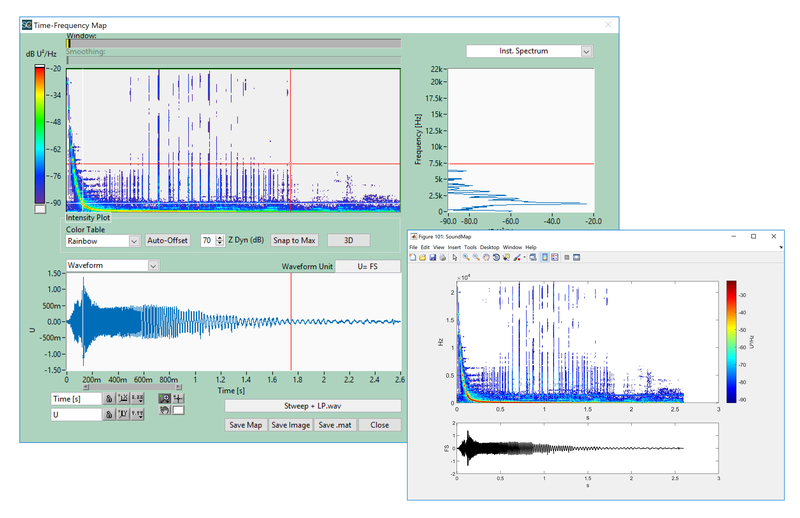 Applications of this sequence include evaluating ANC, noise suppression, voice recognition testing, SNR optimization of microphones, beamforming directionality studies of microphone arrays and more. More. 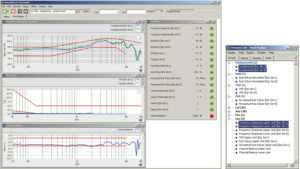 The TIA-920B sequence (part number 3111) tests to the TIA-920B dual-bandwidth standard that applies to both narrowband (NB) and wideband (WB) devices. It also allows a choice between Free Field (FF) and Diffuse Field (DF) as the Listener Reference Point (LRP). The current release measures digital communications devices with handset features, according to TIA-920.110-B and speakerphones, according to TIA-920.120-B. Support for headset measurements, according to TIA-920.130-B will be added in a future release. More. We are excited to announce that SoundCheck fully integrates with the Mentor A2B interface for testing automotive audio connected via the Analog Devices A2B digital bus. 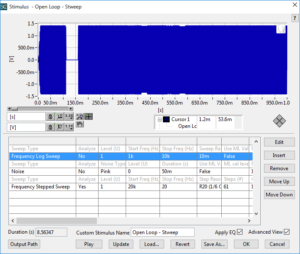 The Mentor Analyzer, which handles the transmission of signal in to and out of the bus, is viewed as an ASIO interface by SoundCheck, enabling SoundCheck to read/write to the device and therefore analyze any transducer connected to the A2B bus. A custom VI permits control of the Mentor A2B interface configuration via SoundCheck. This means that it can be controlled from within a SoundCheck sequence, for example loading configurations and starting/stopping ASIO streams. This makes it an ideal R&D or production line test solution for automotive audio, or for anyone testing transducers connected via A2B bus. Contact your Listen sales engineer for more information. Please see our knowledgebase article for download links and installation instructions. 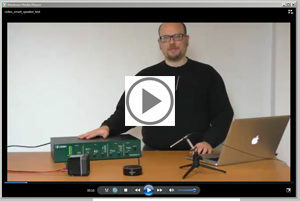 In this short 10 minute video, sales engineer Les Quindipan gives a brief overview and demonstration of the new features and functionality of SoundCheck 16. See how easy it is to test a smart speaker such as the Amazon Echo in this short 4 minute video! 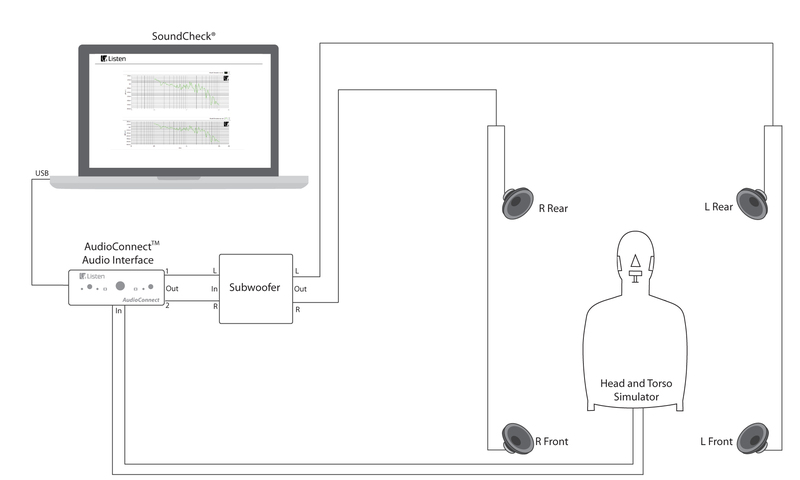 We demonstrate how a SoundCheck test sequence can be set up to automatically activate the speaker, play a stimulus, record the response, and measure both the microphone and speaker performance. 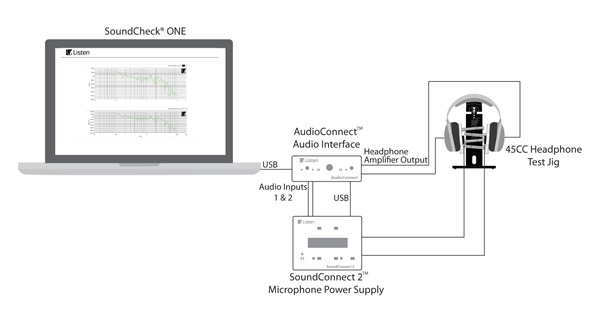 We are excited to announce a new low-cost headphone test package – SoundCheck ONE for headphone testing (part # 1007). This includes SoundCheck ONE, a basic version of the SoundCheck software, along with AudioConnectTM, an audio interface with built-in headphone amplifier. Only a headphone coupler or test fixture and associated power supply is additionally needed to make up a complete headphone test system. The SoundCheck ONE headphone test sequence carries out all basic headphone measurements such as frequency response, sensitivity, THD, Rub & Buzz, Perceptual Rub & Buzz, loose particles, polarity and channel balance. It can be easily customized and saved for specific products by turning individual measurements on and off, and by adjusting settings within each sequence step such as stimulus range and level, tolerance limits, graphical displays, and data saving. It is an excellent low-cost entry level system, ideal for those on a tight budget. Please note that although the SoundCheck ONE Headphone test sequence cannot have steps added/removed or the layout modified, customers may upgrade to a SoundCheck package that supports this at any time in the future, should testing needs expand to require additional functionality. Listen can also offer the GRAS 45CC headphone test fixture along with a SoundConnect 2 power supply for a complete production line test system.